There probably comes a time in every mothers life where they have to come up with a superhero costume. It wasn't my daughter but my nieces who asked for them - one wanted Wonder Woman and the other wanted to be Bat Girl. 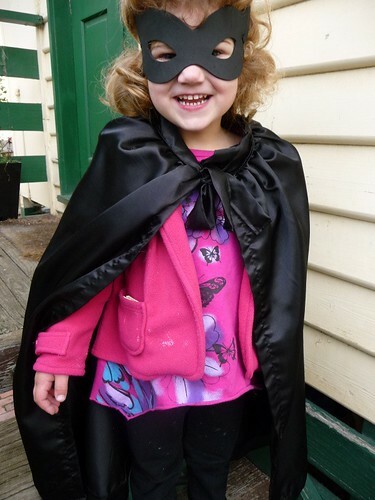 We found some foam bat masks in the shops so I just needed to make a cape for Bat Girl. For the wonder woman outfit I made a cape, 2 arm bands, a crown and a blue sparkly mini skirt. 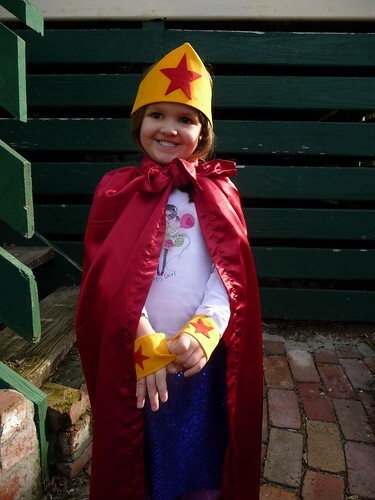 My daughter is modelling the WW outfit in the next picture and is a bit short for it all. I used the Curly Pops tutorial for the crown shape (Karen - thanks for heading me that way!) 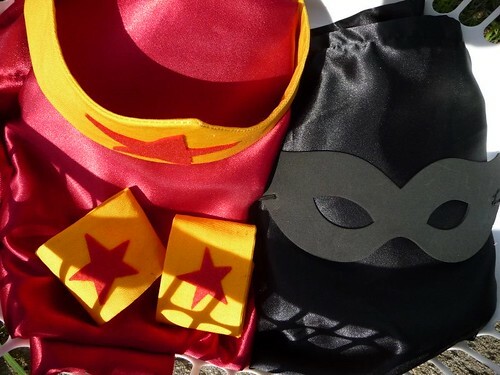 I got a lot of inspiration from the crafster website which provided an array of different WW costumes that people had made and I could pick and choose ideas from that. I fashioned the cape myself - I cut one large piece of fabric to use for the cape then cut a narrow strip (at least 4 inches wide) to make the collar and tie (its basically a thick piece of home made binding). I then inserted the gathered material into part of the collar and stitched the collar and ties in one go. Check out the finished costumes below! Massive thanks to a very wonderful lady at the fabric shop who gave us the end of the bolt for no extra charge which meant I had enough fabric to make an extra black cape for Boo! After all the excitement with the other girls, she wouldn't have wanted to miss out and I'm sure we can think of MANY different uses for a black cape! Supercute! I love how you made wristbands to match the superhero headband. My "Pretty Things" blog is my journey post-baby and my attempts to establish some new creative pursuits. I've always been very crafty doing sewing, quilting, card making and scrapbooking. I'm hoping to make some dresses for my little girl and we'll see what else I get up to!